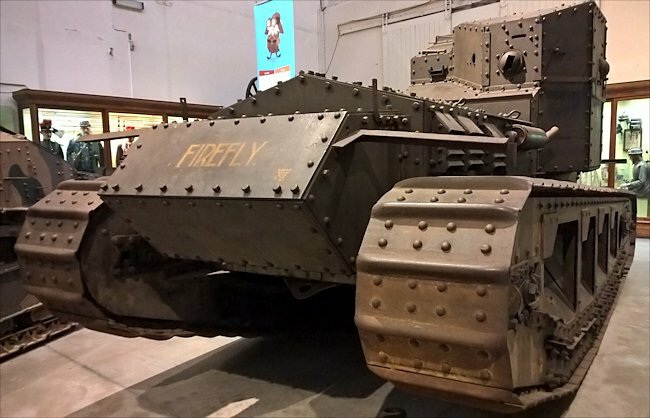 This WW1 British Mark A Whippet tank, named Firefly, can be found at the Royal Military Museum of the Army in Brussels in Belgium. This tank still has its original WW1 paint and markings. It was number A347 of the 6th Battalion Tank Corps, B Company. 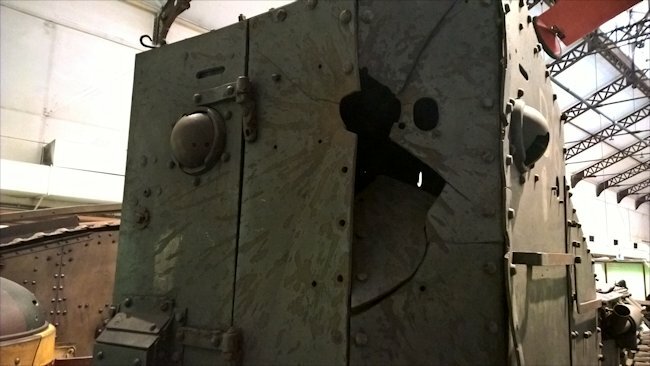 It still carries battle damage from when it was hit on 17 August 1918. It was a gift to Belgium from the British Army and it arrived by train. The World War I British Medium Mark A tank is more commonly known as the Whippet. It got this nickname because of its fast speed when compared with the very slow cross-country walking pace of the World War One British Mark IV and V heavy tanks. Its top speed was eight miles an hour which was double the speed of the heavier tanks. What is interesting about these tanks is that they have no suspension. The tracks do not go around the top of the vehicle. They resemble the configuration used on agricultural tractors of the period. There are rollers along the bottom of the hull that take the weight of the track and also provide some up-and-down movement. Rollers at the bottom of the track in the middle of the weight bearing rollers. They had special bearings that made them go faster. 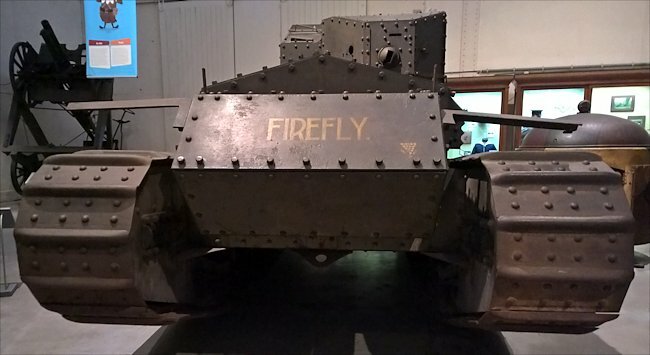 The front of the Whippet tank's hull contains the vehicle's petrol tank. The idea behind constructing a light tank was so they could work with the horse mounted cavalry. In reality the tank and horses working together just did not work, it was hopeless. Horses would stampede, rear up, throw their riders and gallop off if the whippet's engine backfired. The tank could never keep up with the unit of charging horses. What the British Army's senior officers failed to realise was that the whippet tank was a new form of cavalry, not an alternative to or support for horse cavalry. It was powered by two four-cylinder petrol engines that produced 45 horsepower each. These engines were made by a company called Tylor, in London’s King's Cross area and were in fact London double-decker bus engines. They were mounted side-by-side under the bonnet in the front just behind the petrol tank. Each one had its own gearbox behind it which transferred the power via a worm drive to the drive sprocket's at the rear of the track. This meant that each track was independent of the other and rear wheel drive. 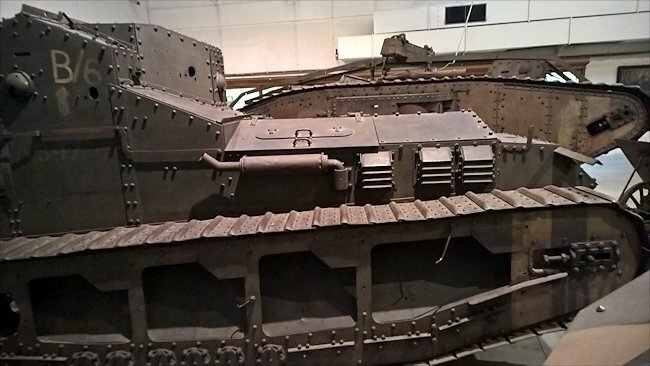 If you look at the rear armoured upper structure of the whippet tank you will notice it is slightly off centre. The driver sat on the right-hand side of the tank and only had vision slits in the armour plating to see where he was going. The battle damage is evident in the rear of the Whippet's back armour plate. The tank was very hard to drive. Each gearbox had its own clutch pedal and separate gear selector levers. The driver had both hands occupied and both feet occupied when changing gears. He had no hand for the steering wheel when performing that operation. It is interesting to note that steering wheel was used rather than the two levers to control the left and right tracks as found on later tanks. The armour thickness was 12 millimetres on average. This was enough to keep out small arms fire but would not protect the tank crew from large pieces of jagged metal shrapnel that were hurtled out of high explosive artillery rounds if they hit nearby. 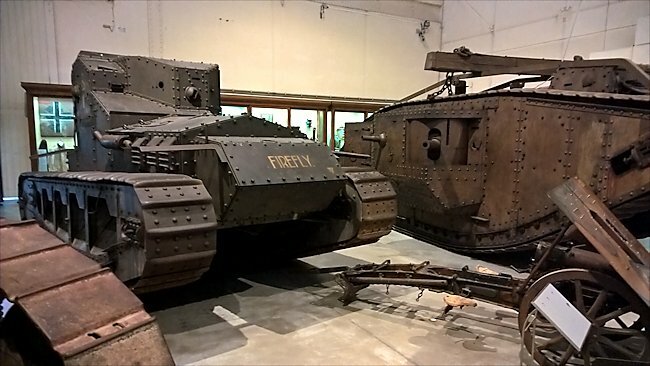 The British built about 200 whippet tanks between 1917 and March 1919. They were constructed by Fosters of Lincoln. Conditions for the three-man tank crew were not pleasant. The tank commander, driver and machine gunner were subjected to very hot working conditions as the heat from the engine was not properly vented away from the fighting compartment. Noxious gases also seeped into the rear of the tank making it hard to breathe. Many tank crews became ill from inhaling these fumes. The big holes between the upper and lower tracks on the Whippet tank are occupied by mud shoots. The army found that it had to rotate tank crews every day. This would give the men that had gone into battle in a with its tank time to recover from the dehydration that occurs from working in a sweat box and the feeling of being constantly sick from breathing in chemicals like carbon monoxide and exhaust fumes. The tank was fitted with a limited slip differential. It joined the drive from the two tracks. If one of the engines had a mechanical failure you could drive the tank back to base on one engine. Because of the extra load on that single engine the driver had to make sure he did not exceed 12 horsepower otherwise the differential would start slipping and the tank would just drive around in circles. A clever design feature on this tank are the sloping sheet metal between the upper and lower tracks. They are mud shoots. The bottom tracks would collect mud as he went cross-country. It would be transported to the top of the track where the mud shoots would scrape the excess mud away and gravity would help the loose mud slide down the metal back onto the ground. There were no model variations of the whippet tank. They were all armed with four 0.303 inch Hotchkiss machine guns; one covering the front, another the rear, one pointing out the left side of the tank and the fourth pointing out the right side of the tank. There were also a number of pistol holes, that had an armoured cover, that could be used to fire the tank crews personal firearms out of at attacking infantry. After the war ended the British government shipped seventeen of the now redundant tanks to Russia where they served with the White Russian Army who were fighting the communist Red Army. The White Russians lost that war and the 12 surviving Whippet tanks were used by the victorious Soviet army up until the 1930’s. They called the tank the Tyeilor after the name they found on the tanks engine block. It is believed that six whippet tanks were exported to Japan where they were used in China up until the 1930s. The German Army had captured around fifteen Whippet tanks that had been abandoned by their crew due to mechanical failure or just running out of Fuel. After the war finished the Germans a few saw action again in the German Revolution of 1918 – 1919 with the Freikorps. They were called Beutepanzer A.